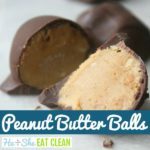 These Peanut Butter Balls are healthy, delicious, and easy to make. They only require FOUR ingredients which make them quick to prepare (no baking!) and even faster to eat! Peanut Butter and Chocolate <<< Makes my mouth water just thinking about that combination! I originally went to make cookie dough, but I decided I wanted something a little more festive. 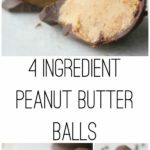 These Peanut Butter Balls are quite simple to make and use ingredients that are probably already in your pantry. They are perfect to take to a party or just have in the freezer for when chocolate is needed! This was originally published on December 22, 2012, and updated December 21, 2018. 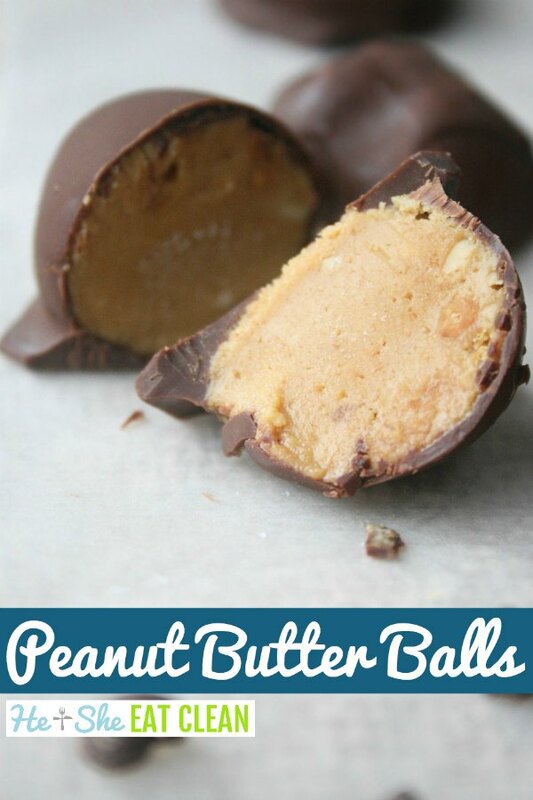 Make sure you chill the peanut butter balls. They will need to chill for at least 45 minutes but can be made ahead of time as long as they are stored tightly in an airtight container or wrapped in plastic. Warm hands help soften the peanut butter balls. If they are getting too warm while working with them, place in the fridge to keep them cool and hard. A trick to help dip the peanut butter balls coat evenly in chocolate is to use a toothpick, fork, or a skewer. If you don’t mind a chocolate mess at the end, feel free to use your fingers! To shake off the excess chocolate off the peanut butter balls, tap your wrist or hand. It works! In almost all of our recipes that call for chocolate, we use a bar of dark chocolate and crush it ourselves using a meat tenderizer after placing the chocolate bar in a Ziploc bag. Mix peanut butter and honey together using a hand mixer until thick (30 seconds – 1 minute). Roll into balls and freeze for at least 45 minutes. Combine chocolate chips and coconut oil and heat in microwave for 1 minute. Stir. Heat in microwave for another minute (or until melted). Let chocolate/coconut oil mixture sit out for approx 10 minutes to slightly harden. Once balls are chilled, dip in chocolate mixture. « Our Favorite Clean Desserts! I just made these with homemade toasted sunflower butter from my food processor- AMAZING! Thanks for the wonderful ideas to keep clean eating easy! These were amazing! I am a huge PB and chocolate hound and these will surely help satisfy my cravings when they attack! I had some extra melted chocolate leftover so I threw some raw almonds in it. Another nice little treat.